Create custom sized O-rings in various dimensions. 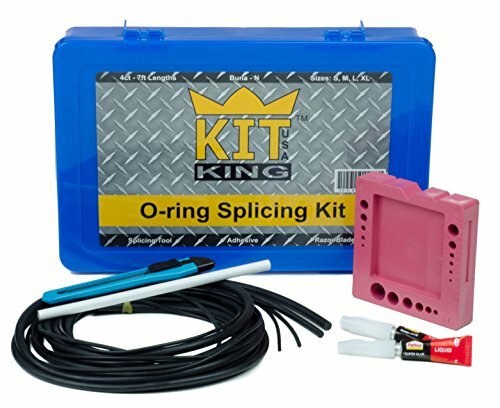 Kit King USA branded O-ring splicing kit that contains 4 different Nitrile (NBR / Buna-N) rubber cordstock pieces. The kit also contains 2 glues, a razor blade, a white marking pencil, and a pink cutting / gluing jig. High quality nitrile rubber is great for custom sealing solutions. Be sure to verify that your purchase is Kit King USA Branded. 20 total feet of cord stock in 4 common sizes. To calculate the length of cord to cut, use ((OD + ID) ÷ 2) x Pi = Length. How to cut and glue: Put the cordstock through the cutting jig and cut with the razor through the gap to get a straight cut. Apply a thin layer of super glue on one side of your newly cut cord. To join use the V notched out section on the jig. Press both surfaces together for 15 seconds. Wait 1 minute to install the oring.